When hosting Web Applications in IIS(and other web servers) you have the option to access that web site using a different port than the default (80). I had previously set up BAM and had some other applications running off of the "Default Site (80)" so I didn't want to host Windows SharePoint Services (WSS) on that port. Instead I opted for port 99 when going through the WSS configuration. When you configure the BizTalk - SharePoint Adapter Web Service you have the option of specifying which site you want to install it in. If you want it to work, you select the site where your have installed WSS. The adapter failed to transmit message going to send port "SendToSharePointLibrary" with URL "wss://MyServer:99/sites/BizTalkDocs/Surveys". It will be retransmitted after the retry interval specified for this Send Port. 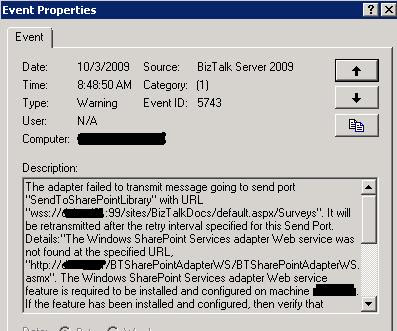 Details:"The Windows SharePoint Services adapter Web service was not found at the specified URL, "http://MyServer/BTSharePointAdapterWS/BTSharePointAdapterWS.asmx". The Windows SharePoint Services adapter Web service feature is required to be installed and configured on machine MyServer. 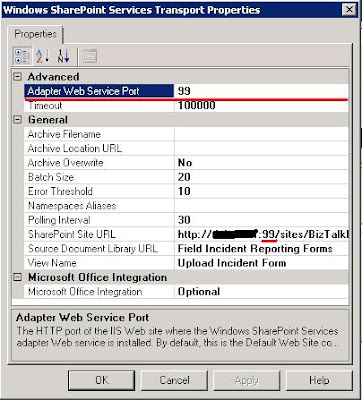 If the feature has been installed and configured, then verify that Adapter Web Service Port and SharePoint Site URL settings on the BizTalk port are correct. 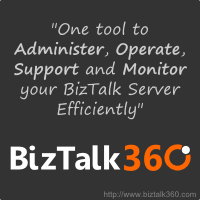 This error was triggered by the Windows SharePoint Services receive location or send port with URI wss://MyServer:99/sites/BizTalkDocs/Surveys. Windows SharePoint Services adapter event ID: 12461". 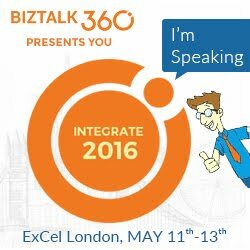 I copied the URL from BizTalk admin, replaced wss:// with http:// and placed it into a browser. The Document Library appeared so I figured it had to be related with the adapter. My inital thought was "Don't tell me the Adapter can't work when you are hosting WSS on a port other than 80". Upon some further digging this wasn't the case. I overlooked the "Adapter Web Service Port" configuration which by default is 80 even though I specify ":99" in the SharePoint Site URL. Once I made this correction, I was able to successfully post documents to SharePoint. I have this exact problem now but I already have the port specfied exactly like you mention. The only thing that might be different is this is part of a cluster I am referencing through a cluster name. I can't think of what else to try exact go to a host header so I can go back to port 80. Host header is another option...our SharePoint team uses them with a lot of sites in our environment as they may have several sharepoint sites on a server but do not want to use ports. Wow, I hadn't seen this option in the WSS Send Port configuration dialogue. A very simple fix. Thanks heaps!